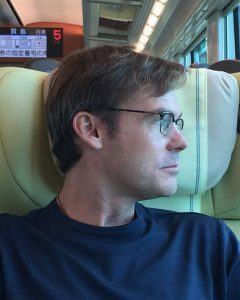 In his first Kyoto walk of the new year, Edward J. Taylor takes us from Kyoto Station to the Imperial Palace on the old route of Higashi-no-toin. 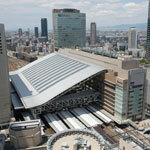 Outside circumstances dictated the day’s walk, in the form of a lunch meeting at Kyoto Station. Having thus decided on a walk that starts nearby, I pass to the north side of the lumbering building, one much unloved when it was unveiled in 1997. I used to feel that it would have been better placed in Tokyo, and that that city’s old station of Victorian brick seemed much more suitable to Kyoto. Now that I know a little more about Tokyo’s history, I recognize that its station is perfect right where it is, as its look honors the Meiji period history when the city took on a new identity, a new role, a new name. 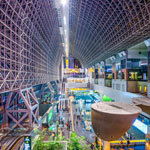 Though I’ve come around and now find Kyoto Station beautiful in its own way, I still find that the structure honors no history, except perhaps a Bubble–era boombox. It serves as a sort of metaphor for why I’m doing these walks in the first place. A metaphor even more apt is that I begin with my back to the station’s Lost and Found office, for what am I doing but looking for the lost? And the street I’ll walk today, Higashi-no-toin, was in the Heian period perhaps one of the city’s most important, leading as it did to the estate of Fujiwara Michinaga, who was head of the powerful Fujiwara clan at a time when the family held its greatest control over the Imperial throne. This mansion, called Higashi-no-toin-tsuchi-mikado-dono, (whew! ), was renovated in 1133 to become the current Imperial Palace. As it is, there isn’t much of interest during the first few blocks. I do note the 100K HYAKKEI Craft beer & Pizza at the corner of Shichijō, and a little further on, the Ginka Coffee Shop from 1928, staying true to its Showa period look, but for a nod to the modern world in the form of a little sign handwritten in English: “Take out OK!” The only history I come across is in the form of Kyosendō, who have been designing folding fans since 1832, and a stone marker at the site where Akamatsu Kosaburo was assassinated due to his embracing Kōbu gattai, which Wikipedia tells me “was a policy in the 1860s Bakumatsu Japan aiming to strengthen Japan against the perceived threat of Western imperialism by obtaining a political coordination between the Tokugawa shogunate, certain major feudal domains and the Japanese Imperial Court.” Little irony I suppose that all of these Kyoto’s markers commemorating the assassination of a military governmental figure were erected in 1942, a time when another military government was at its apex. Much of the rest seem to be guesthouses, which I suppose is one way of dealing with the current tourist invasion of Japan. I know I’ve harped on this point many times, and admit that my take on it is perhaps overly critical. But in a strange way, it is leading to the re-beautification of Kyoto itself. The most attractive and eye-catching buildings that I see on these walks tend to be these very same guesthouses, as they are the only things being built with a historic design. “Little Kyoto” used to be used in a positive sense, referring to a rural town that had kept an authentic look, and therefore harkened tradition. 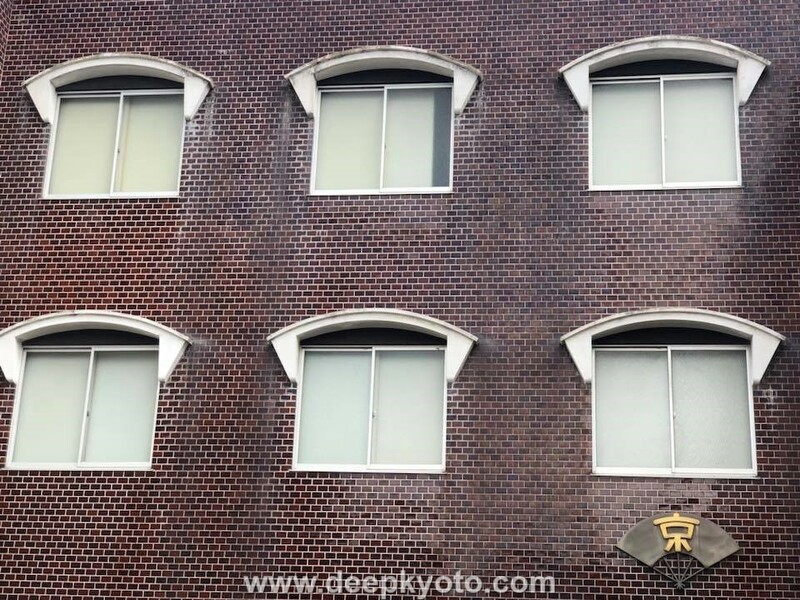 But many of these towns are today concerned with a Kyotofication of a different sort, their characters threatened by what the media calls “tourist pollution.” And oddly, these guesthouses in Kyoto itself are almost a Huis Ten Bosch-ing of Kyoto. The aesthetics have been reproduced, but not the authenticity. One positive side-effect of all this is of course, revitalization. I know I’ve also commented before on how the section between Gojō and Shijō is filling with unique and rather attractive eateries. (There is a definitive stratification to Kyoto’s downtown.) It would be a fun experiment to dine at one each night, working your way down a specific street, then the next and the next, moving from east to west. After a few months you’d have hit them all. 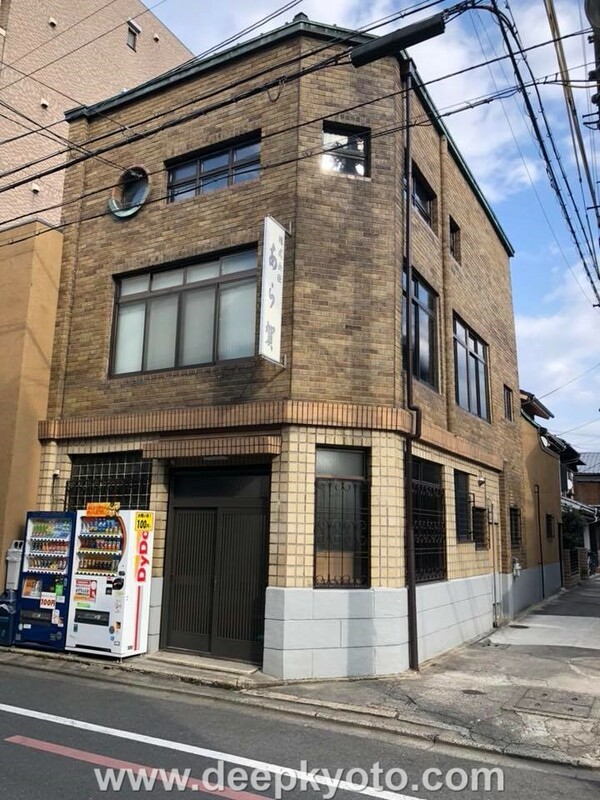 Just over Gojō, my nose is attracted by the tempting aroma coming out of Agiyao, which advertises itself as a fish and wine bar, with an impressive tower of corks piled in its front window. The final block alone has the impressive lineup of Cheers Wine and Cheese Bar, Eggs and Things, the vegetarian Miyakoyasai, not to mention Lobster and Wine Dougetsu. There are of course nods to tradition, sort of. A machiya-looking edifice is superimposed atop a concrete structure, creating an Ando Tadao hybridization. If you happen to break a nail while texting about it, or while taking a selfie, the machiya-housed Gofun Nails will sort you out in five minutes or so, using natural, local ingredients. And amidst all of it is a surprising number of tofu makers. The most unusual find is the neighborhood guild that looks after the Gion Matsuri float Hoshō-yama, unusual in that it stands away from what is traditionally thought as the festival center. The float commemorates the 11th century aristocrat Hoshō Hirai, who successfully broke into the Imperial Palace in order to steal plum blossoms for his lover, the famed poetess Izumi Shikibu. Not being festival time, I don’t get a look at the 600-year old statue of the man, blossoms in hand, but it is said that passersby receive blessings from him for romantic love. So if I find nothing else today, at least I got that going for me. Which is nice. Just over Shijō, I note a pair of wooden figures in a window, blowing jazz. I look up to see I’m standing in front of the intriguingly named Basic Music Books Zakka Café and Bar. As I like a number of those things I head inside, and follow the steps down to the basement, which sells books and used LPs. Along the stairs they’ve aligned most of the recent releases by Tuttle, arguably the top publisher of things Japanese. 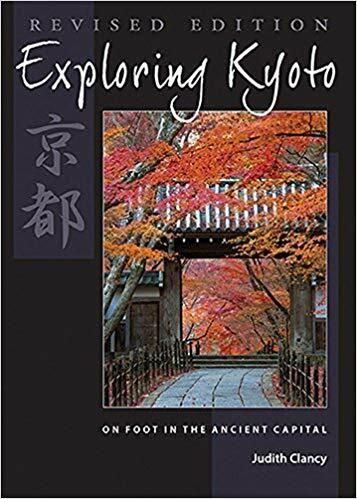 A number of these works were written by names familiar to readers of Deep Kyoto. 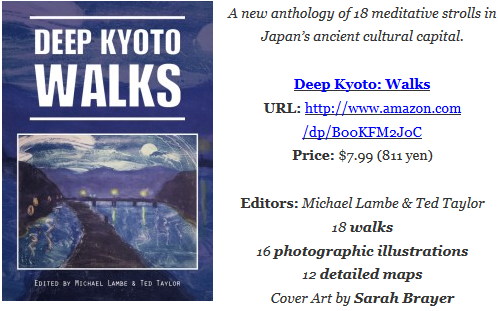 I see that one title is the Kyoto Guesthouse guide, and am immediately curious about the page count. Ninety-two pages at the moment, and counting. I flip through some of the used vinyl, then pass back through the café on the way outside. (There’s something a little too postmodern about a bookshop café filled with people looking at their phones.) This is a particularly vibrant part of town at the moment, as the popular Nishiki Market opens out onto it. An old-timey vegetable shop stands somewhat incongruously among the incredible number of eateries and cafes here. Two of these, Santa Maria Novella Tisaneria and Omoya, hold court in machiya that have been creatively restored in order to allow for ample light and to emphasize open kitchens that are a flurry of action. 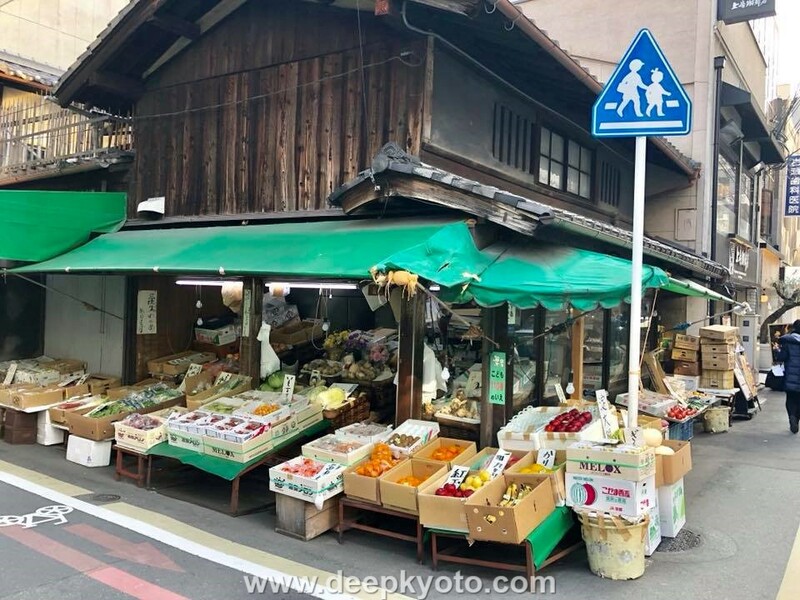 It’s quite possible that these neighborhood restaurants draw water from the stone well created by the progressive grocery store Kyoto Yaoichi Honkan, in order to provide water in case of natural disaster. Being no stranger to these disasters, Kyoto was often forced to recreate itself. 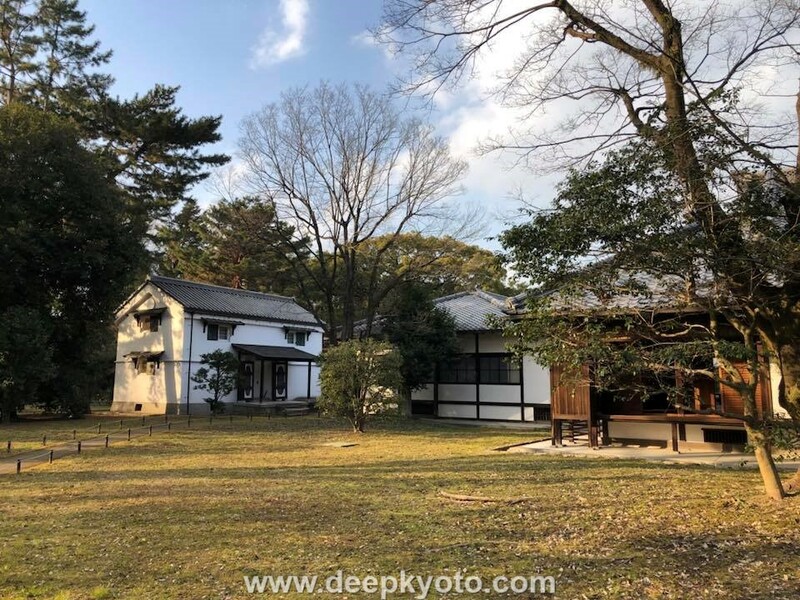 Yet there has been a continuity in the upmarket nature of the area, having been host in the Heian period to Prince Mochihito’s Takakura Palace, the august accommodations for the son of the esteemed Emperor Go-Shirakawa. 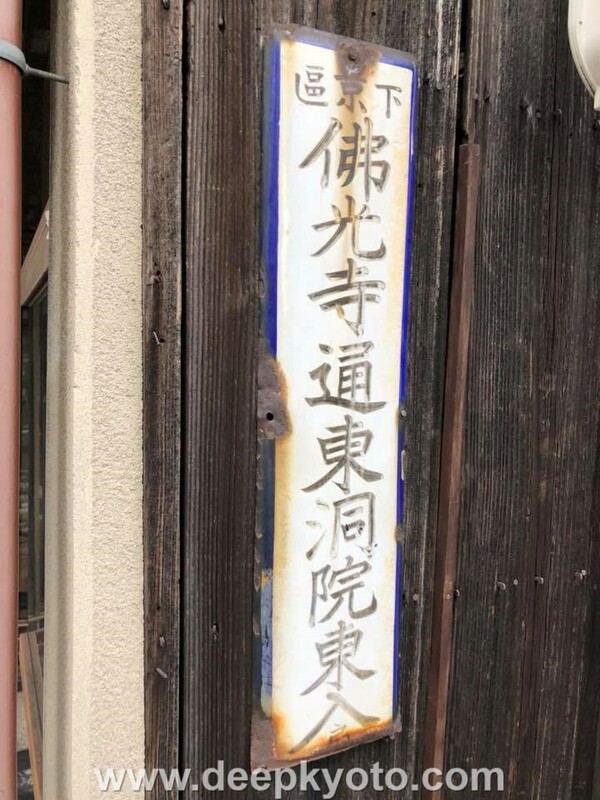 Seven hundred years later the street was the Kyoto residence of the important Satsuma clan, as well as the headquarters of Matsumura Goshun’s Shijō school of painting. 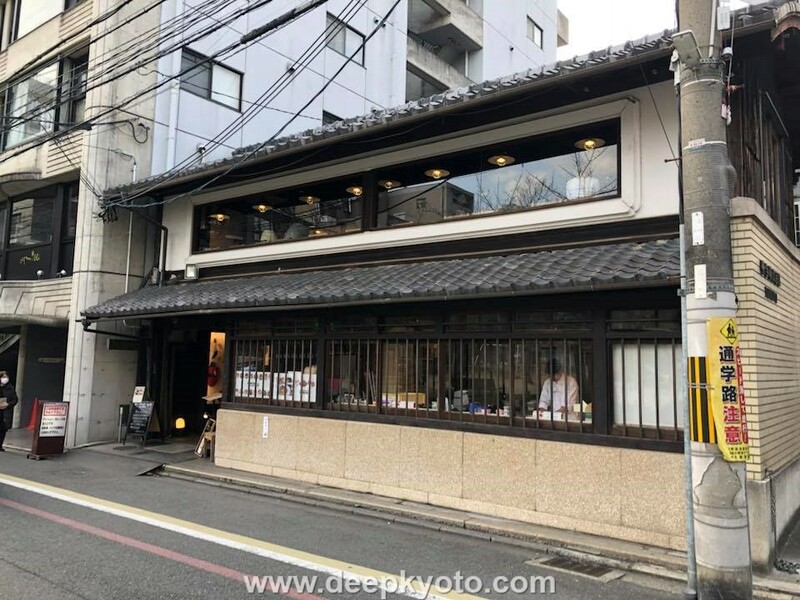 So if you find yourself lacking the proper attire for some of these posh new restaurants, there’s always Kyoto Bespoke, just past Rokkaku-do. The impressive Shimadai Gallery holds court on the corner of Oike, the 1883 building rivaling the beauty of even the most exquisite exhibition held within. 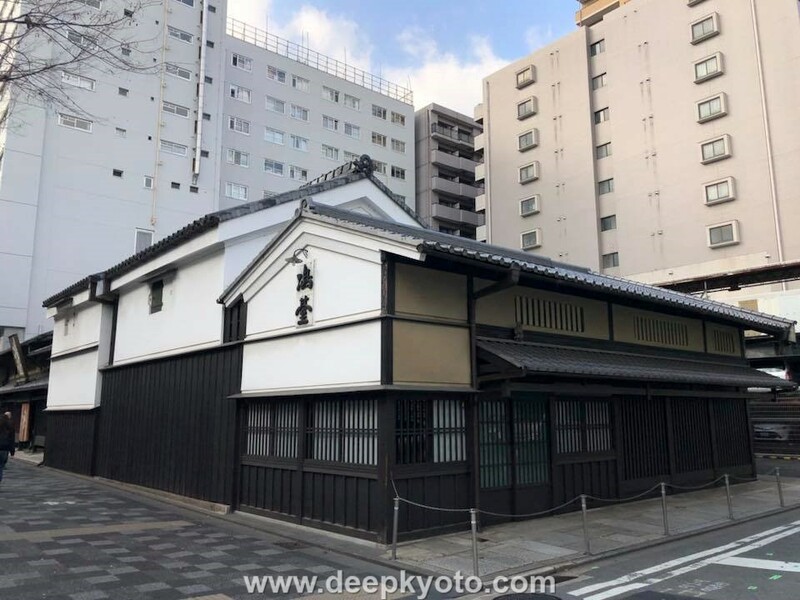 Further on is the site of the former residence of Yoshimasu Tōdō, who, despite his roots in traditional Chinese medicine, is considered the father of modern medicine in Japan. At present, the ample grounds now serve as Chikkan Park, whose name best be pronounced with deliberate care. Yet of these there is no trace, nor of any reminder of the more luxurious estate of the important Michinaga. I hadn’t really expected to find much (the ten-year Ōnin War (1467 to 1477) destroyed most traces of the old capital, even the old palace, which had once stood further west), but I’d thought that Kyoto would have some sort of sign at least. However, all the signs I find honor only the latter Meiji era. Admittedly, the Meiji had been an important time in Kyoto, as had the preceding Bakumatsu violence that had ushered it in. I decide to investigate what had once been the grounds of Michinaga’s Higashi-no-toin-tsuchi-mikado-dono, so step into the Palace Grounds proper. On what I presume to be the site I find the Kan-in-no-miya, free and open to the public. 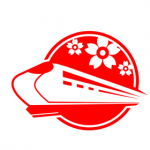 The word miya in its name suggests its imperial connection (much like the toin of its predecessor denotes the residence of a retired Emperor), and indeed the current imperial line stems from the Kan-in, one of the four imperial lineages in Japan. What I see before me is a classical Meiji period Japanese structure, with a façade that references earlier periods, yet whose long wooden hallways and generous amounts of glass have been borrowed from the newly befriended West, and would have been a revelation in 1883 when it was erected. (A handful of similar structures exist throughout Japan, most often as old rural schools.) At that time, this was the home of the Kyoto branch of the Imperial Household Agency, but now serves as a sort of visitor center to the Palace Grounds itself. I wander the gardens, looking for any evidence or sign referring to the old Heian estate, but find nothing. 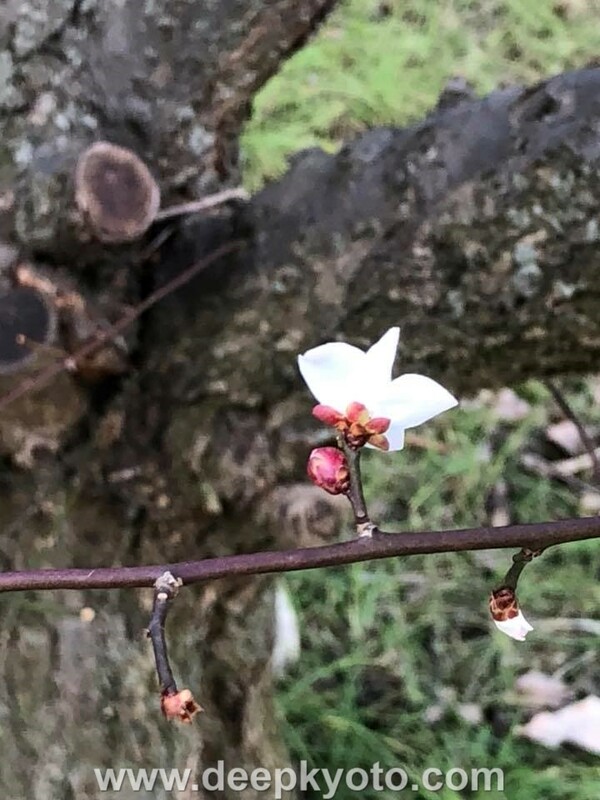 So in the continuing spirit of rejuvenation, I wander over to the plum garden, to see if this year’s warm winter has inspired any into an early bloom.